This week’s G-ology post is being preempted, but it’s being preempted for cupcakes so there’s certainly no reason to complain. The idiocy that ran rampant on Vancouver’s streets last week had far-reaching effects and the impact of the riot struck both downtown locals and those whose hearts broke from afar. What struck me and many others was the brave heroics displayed by the City of Vancouver’s first responders, including the fire department, police, medics and even hospital staff. While many of us holed up in our apartments with the windows shut as tear gas canisters and fire ripped up the streets, others were putting themselves directly in harm’s way in an effort to tame the chaos and essentially save our city. Sometimes saying “thanks” is better shown through actions than words, and if you know me, you know I say it best with food. 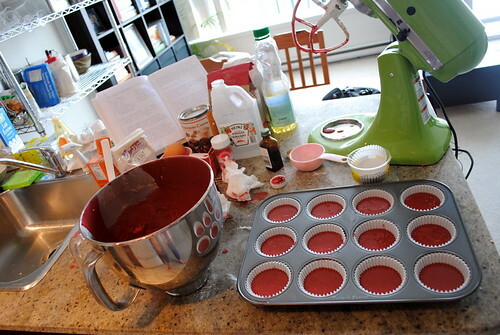 I set out by mixing up quite literally gallons of scarlet coloured batter, skillfully poured the batter into pans and then I baked and baked and baked. 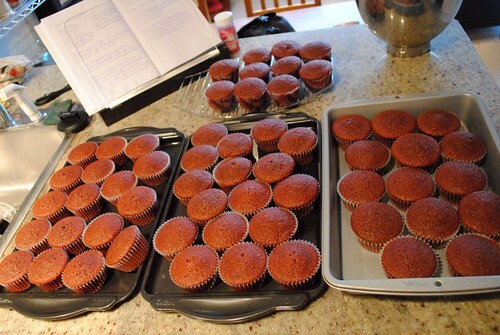 Tray by tray and dozen by dozen, I pulled fragrant, soft and perfectly domed cupcakes out of the oven. It took all of my willpower not to dip my fingers in the batter or the cream cheese frosting. It is as good as it looks! 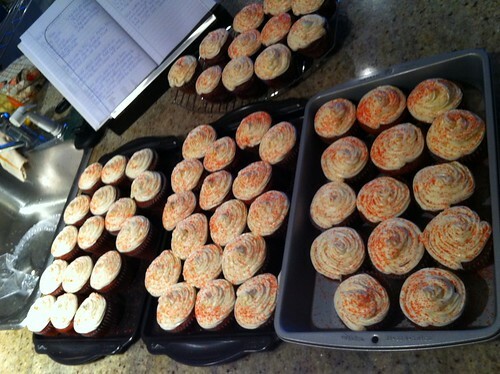 After all was baked and cooled, I ended up with 58 cupcakes. Frosting all those cupcakes is no quick task. Half of presenting deliciously tantalizing food is in the presentation. I made a quick trip to the dollar store to ensure that my cupcakes were adorably packaged. After work yesterday afternoon, my friend and neighbour, Tracy, and I loaded up our arms with cupcakes and set out on foot. 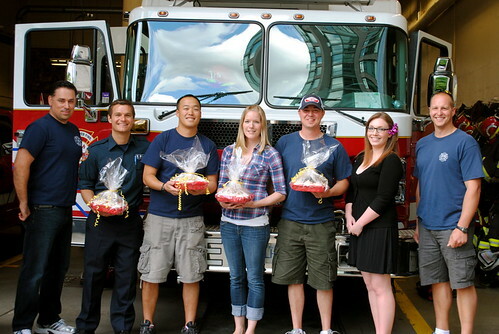 Our first stop was Firehall 8 at the corner of Hamilton and Smithe streets. 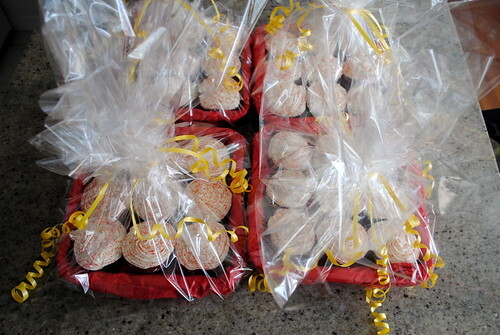 Not surprisingly, two girls with cupcakes were very well received. We’re just lucky we got out of there with our remaining deliveries! 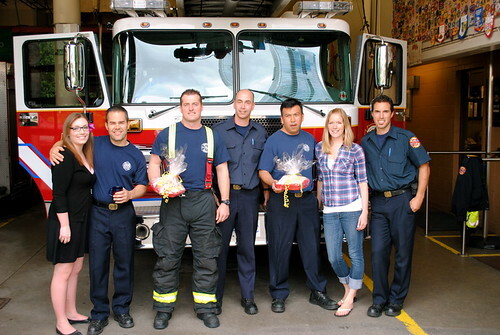 A short walk later, we found ourselves at Firehall 7 on Haro at Thurlow streets as the crew was changing shifts. All of them were beyond appreciated by the fact that residents of this city appreciated them. Our trip was rounded out by camera-shy Firehall 6 at Nicola and Nelson streets as well as the BC Ambulance station at Richards and Drake streets. While most of the first responders we delivered cupcakes to were working on the night of the riot, whether or not they worked that night didn’t matter. These men and women take risks each and every day for the safety and security of all of us. That in itself is something to be thankful for. And speaking of thankful, I’m especially grateful for the extra set of hands and feet that Tracy offered up in helping deliver the dozens of cupcakes! 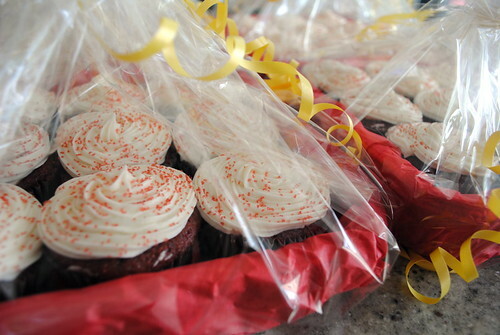 Want to whip a batch of red velvet cupcakes of your own? I snagged this recipe from a friend’s mom and I have yet to taste a better red velvet cupcake (sorry, Heather and Lori). Preheat your oven to 350 degrees. Line muffin tins with paper liners. Whisk together cake flour, cocoa and salt in a bowl; set aside. 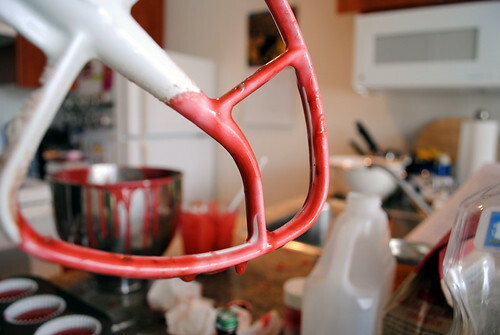 In a mixer, blend the sugar and vegetable oil on medium-high speed for about two minutes. Add the eggs one at a time; mix in colour and vanilla. Reduce the speed and add the flour mixture in three batches, alternating each time with buttermilk. Mix well. 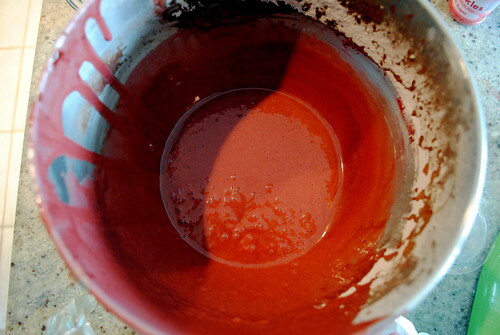 Stir the baking soda and vinegar together in a bowl, add to the batter and mix for 10 seconds. 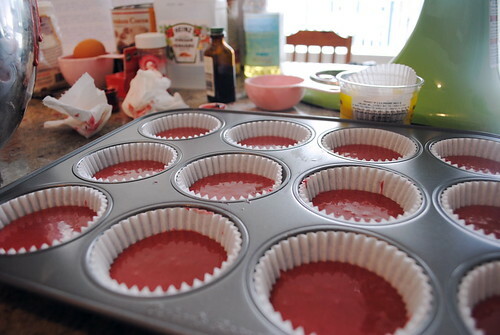 Divide the batter into the lined cups and bake for about 20 minutes. It’s a good idea to rotate the pan at the half-way mark. Cool completely. 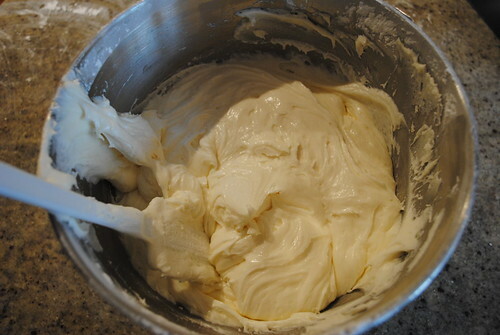 Beat the butter and cream cheese in a mixer on medium-high speed until fluffy. Add the powdered icing sugar one cup at a time until desired consistency and mix in vanilla. Decorate on the cupcakes as you wish! Despite what you might have heard, baking is an exact science. Follow recipes to a T! Line your cupcake tins no fuller than 3/4 of the way. 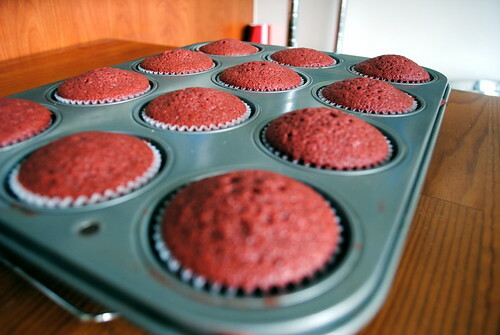 Cupcakes need room to expand so over-filling them will leave you with sunken cupcakes when you remove them from the oven. All-purpose flour is not the same as cake and pastry flour. Always choose and use the latter of the two. Maintaining batter temperature is key so make sure your eggs are at room temperature. The same rule applies to frosting ingredients. Unsalted butter is always better than salted butter when it comes to baking. On September 11th I’ll be participating in the BC-SPCA’s Paws For A Cause fundraiser – for the fourth time! Please considering donating to this extremely worthwhile cause and offering support to Jordy and I! Click here to read more. You are an incredible person Keira. I am so thankful to have had you in my life. Your beauty is contagious. Your cupcakes look awesome! I still haven’t mastered the art of the cupcake and I don’t even make them from scratch! Oh well I’m glad you came up with this idea and I’m glad we went through with it! Felt good saying Thank You to those who do so much for us! What a wonderful gesture…we don’t show our appreciation enough to the people who deserve it! What a very thoughtful thing to do! Thank you so much for sharing!!! 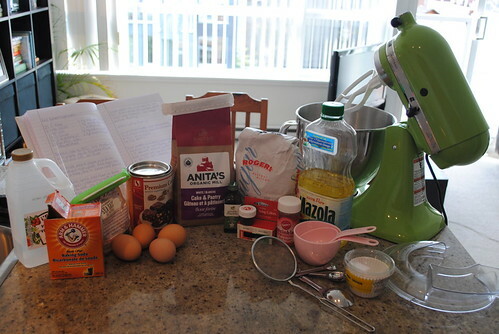 This is the best cupcake recipe I’ve tried.